Dentists, for the most part, want to help all of their patients keep all of their own teeth as long as possible. As awareness of the importance of dental health, patient knowledge, and technology have increased in recent years, dentists are seeing more patients with fewer missing teeth compared to past decades. Still, lost teeth can happen and many patients think it is not a problem if they have lost a tooth and they don't bother getting it checked or replaced. However, a missing tooth or teeth are more than just a gap in your smile; they can lead to significant problems. The longer you wait to fix a missing tooth, the bigger your problem might get. DentalWorks in Columbus, OH is skilled at replacing missing teeth with various advanced dentistry options. Read more about dental restorations before you visit for your consultation at DentalWorks in Columbus, OH. If you have heard of muscle atrophy, you understand that without stimulation and exercise, our muscles can waste away. The same scenario occurs with your gums and jawbone. Holding tooth roots in place keeps your jawbone and gums stimulated. When you lose even one single tooth, the bone and gum tissue holding that tooth begins to weaken from lack of use. Patients who are missing all of their teeth on their top, lower, or both arches may be so impacted by atrophy that their jaw begins to appear small. Patients who have lost teeth, whether it be a single tooth, a few, or more, can also develop negative impacts in their overall health as well as their quality of life. It can be difficult to chew properly or speak clearly. People with several missing teeth might suffer from self-esteem issues. This can also start to impact their social life as they start to stay home rather than go out, which they used to love. Dental professionals across the country highly suggest fixing missing teeth to avoid the many issues that may occur. Maybe your decision to not treat your missing tooth is a cost issue or perhaps you simply didn’t realize that there were long-term issues. However, if you've lost one tooth or more, it’s important that you look into ways to restore your smile. The longer you wait to replace a tooth, the bigger your risk for further gum and jawbone loss as well as other problems. Common replacements include implant-supported restorations, bridges, and dentures (full and partials). A lof of dentists think custom implanted restoration are the best option for replacing a missing tooth or teeth. Technological advances in dental restorations have made implant dentistry a leader in the treatment for missing teeth. The principal reason is because they can replace the tooth root in addition to the visible crown of a tooth. Implanted restorations avoid future bone loss because the metal post is embedded into the gums, stimulating the bone and keeping it functioning like it should. Your custom restoration will be attached to the metal implant(s). There are several advantages to choosing an implant-supported crown, bridge, or denture. Implanted restorations function and look like real teeth, plus they can generally last for a long time if you take good care of them. The principal downside to implanted restorations is a longer recovery period and cost. Despite the recovery and high cost, implant-supported restorations are the preferred method to replace missing teeth. A dental bridge is one or more false teeth that are held in place in the mouth by attaching to surrounding teeth. A dental bridge is comprised of a false tooth with a dental crown on one or both side of the false tooth. These crowns are cemented to surrounding teeth to hold the false tooth in the gap left behind by your missing tooth. A custom bridge will keep the rest of your teeth from moving out of place, but they do not prevent atrophy in your gums and jawbone. Bridges can last for a while. They also typically cost less than implanted restorations. Partial or full dentures are a dental appliance or restoration that are often used if you need to replace all or most of the teeth whether you need the top arch, bottom arch, or both. Dentures consist of a plate that supports a group of false teeth that attach to your natural gums. Made custom from your digital impressions, modern dentures are manufactured to look natural. Partials dentures can be used for patients who are missing many, but not all their teeth. Although traditional removable dentures restore the appearance and function of your smile, they cannot prevent atrophy in your gums or jawbone. Those with removable dentures will have some level of atrophy plus a change in the shape of their lower face. This is another reason that implant-supported restorations are the preferred choice for the replacement of missing teeth. Should you have missing teeth, you should learn about the risk of leaving gaps in your smile. If you'd like to get more information about your restoration options, we invite you to contact DentalWorks in Columbus, OH. Our advanced practice offers different options for restoring missing teeth and we can help you choose one that suits your goals and budget. We take many types of payment and, if needed, our compassionate staff will be able to help you find medical financing. Get your missing teeth replaced with a restoration so you don't have to deal with issues later, like misalignment or atrophy. 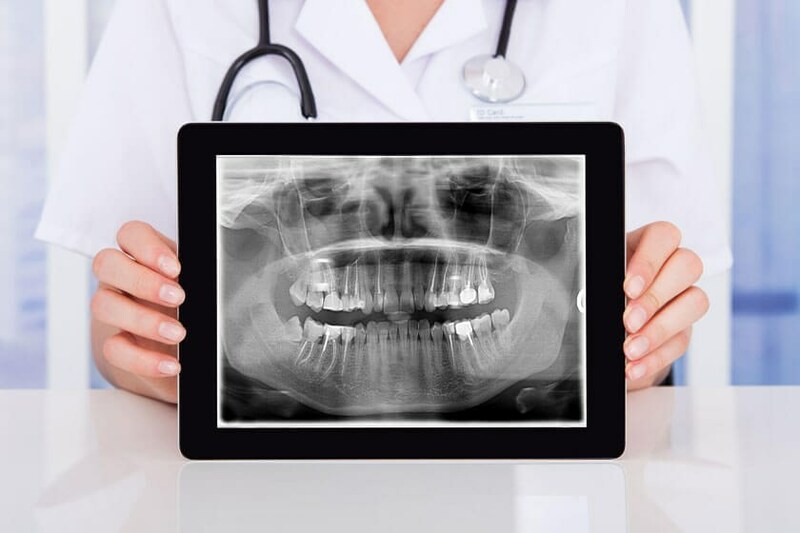 We look forward to speaking more regarding the subject of missing teeth during your private consultation.